Two net-zero energy buildings show it takes time to see if new buildings meet expectations. The Living Building Challenge, a program of the Northwest-based International Living Future Institute, is widely regarded as the world’s most rigorous green building performance standard. It has redefined the design and construction process for more than a hundred projects internationally of all scales and types. Locally, projects such as the completed Bertschi School science classroom and the Bullitt Center, which is under construction, show that the aspirations of the Living Building Challenge can be realized. One of the many transformational aspects of the Living Building Challenge is the requirement to certify the project after a one-year occupancy period is complete. Certifying projects based on performance rather than design predictions brings rigor to certification and offers the building owners a pathway to understand the performance of their building. Both the net-zero water and net-zero energy requirements within the Living Building Challenge must be monitored closely during the occupancy period to confirm that the design predictions are actually being realized. Now that the first Living Building Challenge projects have been certified, we have an opportunity to learn from the occupancy period of those projects and to assemble a case study database of actual energy and water performance for net-zero water and energy buildings. The first fully certified projects have many lessons learned to share. This science classroom building on Hawaii island used much less energy than predicted. A never-used cooling system had been installed based on weather data from a warmer part of the island. One of the first projects certified as “living” was the Tyson Living Learning Center, a 3,000-square-foot educational center near Eureka, Mo. It opened in 2009 on a satellite campus of Washington University in St. Louis. The most remarkable thing about the certification of the building is that it was a design-bid-build project on a fast-track schedule. During the first few months of occupancy it became apparent from the online energy metering system that the project was not on track for net-zero energy. The energy demand was clearly outpacing the energy generated. Two of the photovoltaic panels intended for the roof had been value-engineered out of the project during construction. The team realized they needed to analyze why the performance of the building was so different from the energy model predictions and find ways to reduce the energy demand. The first step was to commission the systems and to perform heating, cooling and building envelope audits to assess infiltration, insulation, and system design and performance. As part of the commissioning a blower door test showed there were areas of the exterior walls and ceilings that were missing insulation, and that air infiltration through the building envelope was a significant issue. Large garage doors that connected the meeting rooms with the outside in summer were also responsible for transferring heat loss. The team also realized that neighboring trees were shading the photovoltaics on the roof more than anticipated, resulting in a lower energy generation than predicted. The team made some immediate changes such as adjusting thermostats, trimming some trees and making envelope upgrades. They also added two pole-mounted tracking photovoltaic panels at the front of the building. The result was immediate. The online metering system showed that the energy demand had decreased and the energy generation had increased, resulting in a net-zero building over the next 12 months. The need to demonstrate net-zero energy over the 12-month period before being able to certify under the Living Building Challenge caused a tracking and analysis effort around the building performance that may not have occurred otherwise. Current data on how the building is performing can be seen at bit.ly/16izhy. Online metering for energy demand and generation was a crucial part of tracking the performance of the building, not just over the one-year occupancy period but also on an ongoing basis. Also among the first projects to certify as “living” was the Energy Lab at the Hawaii Preparatory Academy in Kamuela on Hawaii island. The building is a 6,000-square-foot science classroom. During the design phases the team analyzed its energy performance by using computer-based ventilation modeling, daylighting analysis and energy modeling. The Energy Lab functions as a teaching laboratory. The school’s head of science, Bill Wiecking, and his students monitor every energy use in the building. Plug loads can be switched off when they are not in use, and energy use can be compared from one time point to another. The efforts made to understand and monitor the energy use of the building enabled significant reductions in its energy demands. Any nontypical energy use is immediately apparent and can be tracked. During the first few months of operation it became clear that the building was generating significantly more energy that it was using. Given that the building is on a school campus, the excess energy is being supplied to the campus electrical grid for use by other buildings. Analysis during the occupancy period showed that the cooling system that was installed as a backup to the natural ventilation system was actually never used. The ventilation modeling had used weather data from the only available weather file on the island, from Hilo International Airport on the east coast of the island. The weather station installed at the project showed that the weather patterns at the site are significantly different from Hilo. Kamuela is on the north side of the island at a higher elevation, and has much cooler temperatures in summer. These two projects saw benefit to their occupancy period in different ways. 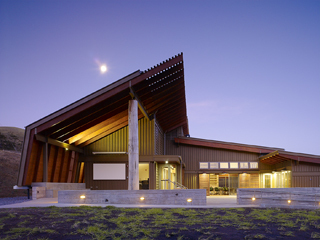 The Tyson Living Learning Center used the occupancy period as an opportunity to trim the energy demand and increase the energy generation to get back on track to net zero. The Energy Lab used the occupancy period to understand exactly where energy was being used in the building and to reduce the usage much further than design predictions. Both projects demonstrate that certifying projects based only on design predictions rather than actual performance does not give us an accurate picture of actual energy use. Achieving net-zero energy is a challenging proposition, one that is hard to verify without metering and analysis during an occupancy phase. Fortunately, the Living Building Challenge and the newly released Net Zero Energy Building Certification program both require an occupancy phase before certification can occur, providing valuable lessons learned and a wealth of performance data for future projects. A detailed case study of both projects mentioned in the article is available on the Living Building Challenge website at ilbi.org/lbc/casestudies. Amanda Sturgeon is the certification director for the Living Building Challenge and the International Living Future Institute.